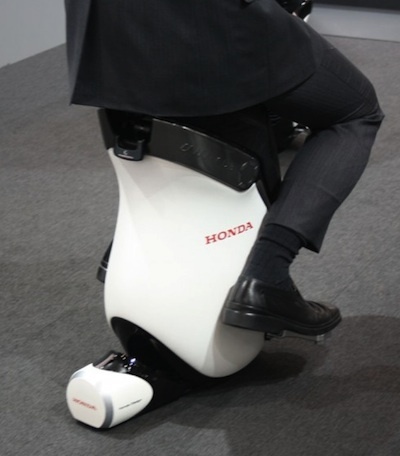 Honda has just introduced their latest tumblebug - or rather, its UNI-CUB beta, a small personal mobility device. Dubbed ‘UNI-CUB Beta’ it weighs lesser at 25 kg, and uses a lower seating position (lowered to 620 mm). Honda says that the usability level of the concept is higher than before, and the materials used in its construction are enhanced, making the vehicle lighter. Powered by a lithium-ion battery pack, the vehicle can reach a top speed of 6 kph. The batteries run out after a distance of 6 km (or 1.5 hours usage) when used at a speed of 4 kph. The vehicle is being offered for testing purpose to Japanese businesses and organizations on fee-based lease which will help the company test the feasibility for its mass production.